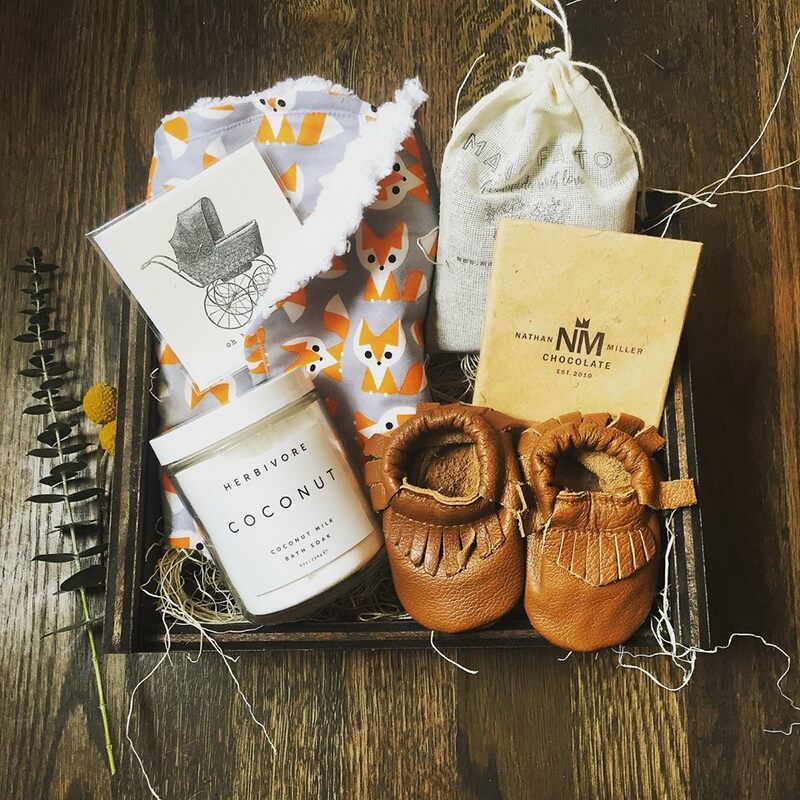 Handmade giftboxes filled with lush blooms, artisan sweets, organic coffee and other small batch american made goods. What does manofatto mean to you? Manofatto, which is a slang way to say handmade in Italian, is rooted in family, quality, and thoughtfulness. We are very family orientated: Katelyn is the owner/box curator, her husband Craig makes the boxes, and her sister Gabby is the calligrapher. Our goal was to bring thought, love, and quality back into gifting. I am in the business of making people happy and when I see it firsthand, it makes my heart feel very full. Opened on April Fools Day, 2015. All products and goods are sourced from American brands. They are constantly product testing new brands – a pretty great job perk. Wake up, feed dog, make coffee, check email/Instagram and engage with my followers whom I love(! ), fulfill email orders, walk dog, pack up orders, possibly stain boxes, update website/Facebook/Instagram, most likely run over to FedEx to drop packages, possibly out for deliveries and picking up flowers at Stevens and Son, workout, feed dog, make dinner, and re-charge to start over tomorrow! I’m inspired by all of the amazing female business owners in Denver! They totally rock and it makes me so proud to live here. In the work, I’m inspired by colors and textures, and finding the perfect gift compilation for the lucky recipient. Lastly, I’m inspired by my Mom. She works so hard and does such an enormous amount for her family, but she balances it with having a great time, not sweating the small stuff, and always remembering to take a timeout to eat a good meal when needed. I owe her the world. 1) Surviving year one of the business! It was a big milestone for us. 2) We worked our butts off and did a customized (and very time intensive) 150 box order right after Christmas. My fingers were numb from tying twine! 3) Working so well and getting along in business with my husband. We are a great team. Christmas Eve 2014, fueled by lots of pasta and wine, me, my best friend, my cousin, and my sisters sat around the dinner table until 2am dreaming up a giftbox business. Less than a month later I was writing up a business plan.